Roll Post shelving is widely used for the storage of files and archived records in business, health care. Shelving can be configured either in single sided or double sided rows. Medium Duty Roll Post shelving can be used for storage of heavier records such as medical imaging. An extensive range of accessories allows the shelving to be divided into smaller compartments. Accessories: Wire Dividers, PVC Coated Wire File Racks, Roll Out File Suspension, Lateral Filing Frames, Roll Out Drawers, Roll Out Reference shelves. Mobile Shelving with either manual or mechanical drive provides maximum storage capacity in a smaller area than static shelving. Applications – File & Archive storage, Retail reserve stock, Spare Parts Inventory. Mobile shelving provides a dense storage system by enabling a considerable amount of shelving to be fitted into a small area by reducing the number of aisles used to access the faces of the shelving to one. 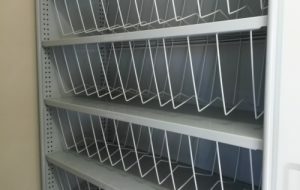 Multiple bays of shelving in either single or double-sided configurations are mounted on mobile bases that run on tracks. Mobile shelving systems may be either on low profile tracks laid on the floor allowing wheel chair access , self based systems that can be easily re-located, or for large systems, fixed to the floor. Mobile stacks of shelving may be moved either: manually, by mechanical means or electronically to create an aisle for access. As per shelving, however limitations on length of stacks and loads apply. Please refer to Maxstor Pty Ltd.